The golf course at Muskoka Bay Club sits at “The Gateway to the Muskoka Lake District” and it’s within this rugged landscape that Doug Carrick designed a layout that blends in beautifully with its surroundings. Part of a large residential development, the course opened in 2006 to great critical acclaim for a creative routing that takes it over rocky cliffs, through deep wooded valleys and around scenic wetland areas, flowing effortlessly from 1st tee to 18th green. Featuring dramatic elevation changes and undulating, tree-lined fairways that wind their way around the property, the layout is characterized on almost every hole with at least one natural Muskokan rocky outcrop. Forced carries are inevitable on such tortuous terrain but the architect took care to elevate many of the tees, giving golfers a view of the landing area and reducing the number of blind shots. For big hitters, the par fives are maybe reachable in two shots – except for the uphill 14th which measures all of 593 yards from the back markers. Amid beautiful, sparkling lakes and breathtaking landscapes lies Carrick Design’s second Muskoka masterpiece – the Muskoka Bay Club. It’s the heart and soul of the area’s largest recreational golf community, an 850-acre development hidden from the hustle and bustle of the city at “The Gateway” to Ontario cottage country. For this project, we took the most rugged terrain and thoughtfully adapted it to create one of the most visually stunning golf courses to be found anywhere. Our client asked us to leave the less rocky land for the 1,000-unit $500 million eco-friendly master planned residential community in order to minimize servicing costs. It turned out to be a brilliant strategy, as our design team turned rocky cliffs, deep valleys, scenic wetlands and dense woodlands into an impressive layout that flows effortlessly through the rugged Muskoka ridges. This is a course that builds with suspense and excitement from start to finish yet it’s designed to be extremely player friendly when played from the appropriate tees. Finding the perfect routing took time, patience and creativity from our design team. 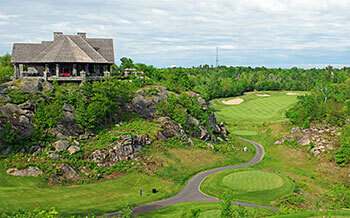 The dramatic elevation changes, thought provoking shot values, undulating fairways, ragged bunkers and subtle greens create a series of uniquely memorable golf holes – each punctuated by Muskoka’s signature natural rock outcroppings – have made it the talk of the town and the place to play in Muskoka. Muskoka Bay is probably the best public golf course in Ontario. The course is difficult but very dramatic and extremely fun. The highlight of playing Muskoka Bay is definitely being able to see (and hopefully avoid hitting into) the Canadian Shield. These large rock formations bring much interest and excitement to the course though the one drawback of the rugged terrain is the difficulty to walk the course. Thankfully, a cart is included in the green fee. Super golf course. Don't wear cargo shorts because they will definitely send you packing. Fortunately they have lots of men's clothing shops in town. The lay out is top 10 in Canada and full of forced carries, spectacular views and miles of marshes. It is worth the $250 they squeeze out of you, but just. Still, a fantastic course.